The Fixing America’s Surface Transportation (FAST) Act was signed into law by President Obama on December 4, 2015. The FAST Act is a five-year bill that will slightly increase funding and slightly change some policy. The biggest change is that it will create long-term certainty for states, local governments and transportation stakeholders. Overall the active transportation community did really well. The new bill includes an increase in funding for bicycling and walking and makes nonprofits eligible for that funding. The bill also creates a new safety education program and, for the first time, includes complete streets language. We didn’t get everything we want, and there are some thingswe don’t like, including changes to the metropolitan transportation alternatives funding and changes to highway safety funding. There are also several places we wish language could be stronger, but overall the FAST Act is an improvement on MAP-21 for biking. Thank you to everyone who lobbied at the National Bike Summit, responded to our action alerts and helped us build support for this bill. Finally, we have one more ask: Please help us in thanking our many allies and champions in Congress who made this bill a success for us. Over the next week or so we will be broadcasting our thanks on twitter and Facebook and through our action alert system. Please join us in thanking Senators Cardin (D-MD), Cochran (R-MS) and Boxer (D-CA) and Representatives DeFazio (D-OR), Larsen (D-WA), Blumenauer (D-OR), Buchanan (R-FL) and Zeldin (R-NY). Here’s an explanation of the big wins and the table below gives more specifics on the changes in the bill. What’s in it for Biking? Nonprofit organizations are now eligible to apply for funds. This makes it easier for nonprofits to do safety and education for Safe Routes to School programs. It also means that nonprofits who run bike share programs can apply directly. Funding increases from $820 million to $835 million in 2016 and 2017 and to $850 million in 2018, 2019 and 2020. The program maintains its competitive nature. The funding program is no longer a stand-alone program. It is no longer the Transportation Alternatives program; it is now a set aside in the larger Surface Transportation Block Grant (STBG) Program. 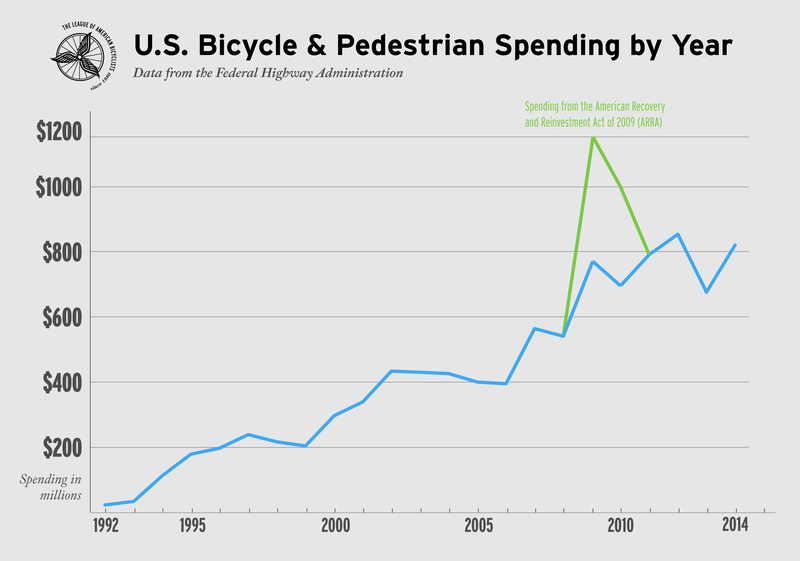 Only states in which 15% or more of overall fatalities are bicyclists or pedestrians will receive funds. Last year Congress passed a directive to require states and metropolitan areas to set goals for reducing bicyclist and pedestrian crashes and fatalities. This new program will help states fund that work. The time period used to determine state eligibility for these funds was not specified in the bill. Information about the number of people killed while using all modes of travel is available through the National Highway Traffic Safety Administration (NHTSA)'s Fatality Analysis Reporting System (FARS) database: http://www-fars.nhtsa.dot.gov/States/StatesCrashesAndAllVictims.aspx. The FAST Act directs the US DOT to encourage states and Metropolitan Planning Organizations to set design standards to accommodate all road users. It also requires the US DOT to produce a report on implementation and best practices in two years. The bill also broadens the guidelines state can use when designing roads, and gives local jurisdictions the right to choose different guides from the state in certain circumstances. This allows local governments, who often want to be more progressive, the opportunity to do so. The FAST act is a true step forward for bicycling and walking, and the League looks forward to working with the government agencies and advocates to make the most of these opportunities. TAP Element MAP-21 FAST Act League Support? The TAP section still has this language. Disappointed not to address this language in TAP section.